Most biology teachers must eventually accept the awful truth that they will need to include chemistry in their biology classes. For years, the only chemistry I had to worry about was the very simple photosynthesis equation which was fairly easy to explain and also presented in an “unbalanced” form. When I started teaching AP biology, I had to relearn many concepts of chemistry that confounded me as an undergraduate. I can’t say that I didn’t feel a bit of terror at the very idea of having to teach redox reactions. Luckily, I’ve come to a understanding with chemistry that involves mainly a focus on the organic side of things, focusing on the three main organic compounds found in life forms: nucleic acids, lipids, carbohydrates, and proteins. We do a little bit with reactions on how polymers are built using dehydration synthesis and how they are broken down with hydrolysis. I’m also a little more comfortable explain how electron orbitals play a role in carbon bonds and how this in turn results in the long chains of carbon that are both structural and functional polymers of life. Organic chemistry isn’t so bad! All materials can be purchased from Amazon, and some can even be substituted. 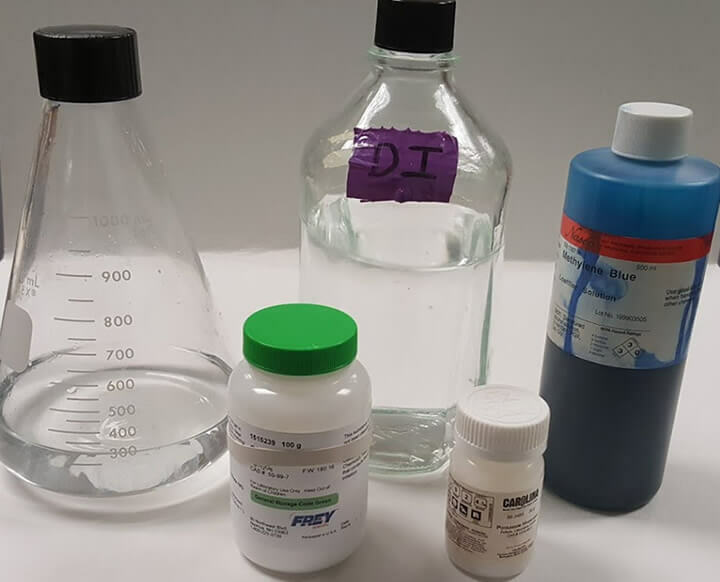 The flask contents will go from clear to blue when shaken repeatedly, though this demonstration must be made within 15 minutes of class, eventually the solution stops changing color. I actually prepare the contents in front of the class and describe each of the reactants, also demonstrating proper lab protocols by wearing safety goggles. It’s a good introduction or review of chemistry for biology class. At this point, open questions up to the class for their hypothesis for why the color change. Some will remember from chemistry that adding oxygen (shaking the contained) will cause some kind of reaction. Basically, the glucose acts as a reducing agent and turns the methylene blue to a colorless form. Shaking raises the concentration of oxygen in the solution and then oxidizes the methylene blue back to its blue state. This guy does a great job of explaining the process and can be used as a substitute if class materials aren’t available.